I am bound and determined to make 4th grade fun for me for the kids. I think it's the kindergarten teacher in me, but there NEEDS to be a seasonal craft up in my room. But the question remains...can we do crafts in 4th grade?!?!?! Welp, I tied it in with a little research project, so I am going to say YES! I haven't put the project up on the bulletin board in my room yet, but I am too excited and needed to share this idea with you before I had all of the photos ready. We made a scarecrow craft AND did some research on the history of a scarecrow! I made it available in my TpT Store if you want to try it out with your students. I have been struggling in 4th grade because I feel like I am either making the assignments too difficult, or too easy for the kids. I haven't found my rhythm yet to know exactly what they need. BUT this was perfectly at their level AND they were completely engaged during the whole assignment. Ahead of time, I searched "the history of a scarecrow for kids" and found this link. (If you want a more detailed document to go with this specific link, click HERE, you can download it for free! The one in my scarecrow pack is more general, but this one is detailed to the link above.) I was so excited because it is a link that hits a dead end, and there isn't any type of advertisements on it. I had the kids answer the questions to guide them in their research. They loved being able to use the computers to find the answers, instead of reading from a book. Once they finished their research, they had to write a summary of their findings. 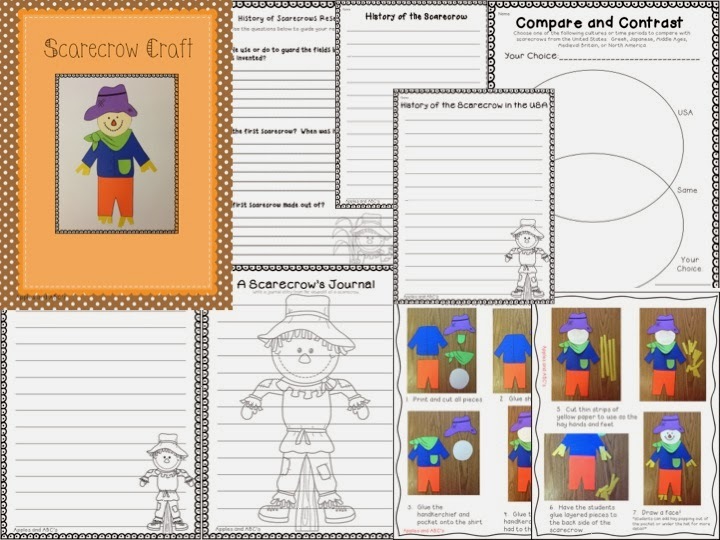 We still are going to complete the other activities I made, which include writing a journal entry from the scarecrow's point of view and comparing and contrasting scarecrows in different countries. Here is our scarecrow bulletin board. I posted their research project on the bulletin board next to this one. Overall, the kids really go into it! 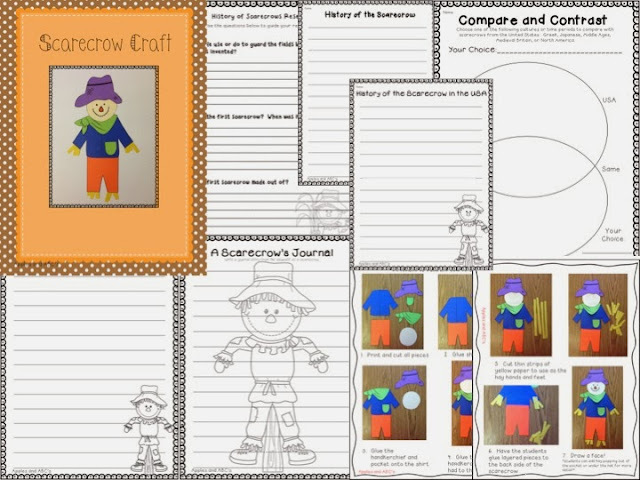 You can get the Scarecrow Craft and Research Project HERE. I also have a Kindergarten version of this craft in my TPT Store!!! That scarecrow is so dang cute!!!! 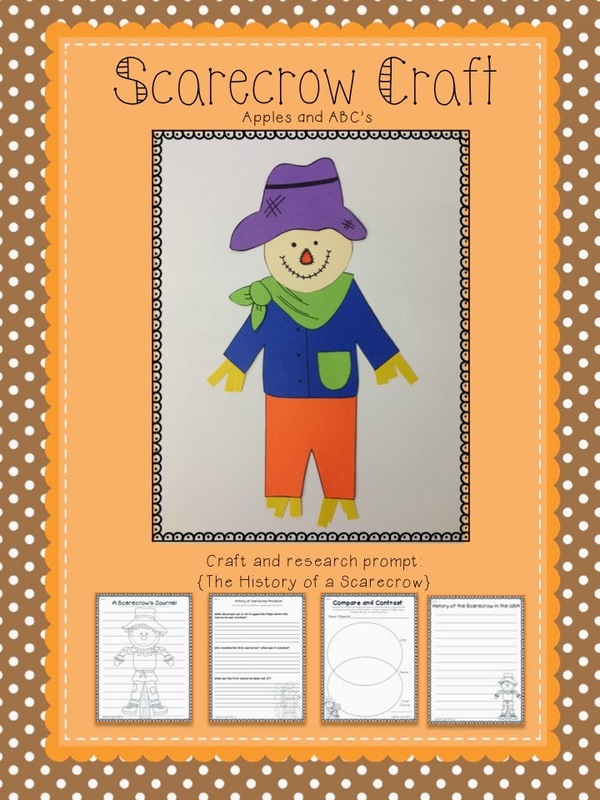 I love the idea of having the students research the history of scarecrows. Your creativity shines through regardless of the grade level!